Adorable baby dragon breathes a fine mist that looks like fire. Better for younger children, as it doesn't do much else. This is one of the cutest toys we’ve come across this year. The sounds and movements combine to create some incredibly expressive responses when the dragon’s nose or belly is rubbed. Cuteness aside, what really takes the cake for most users is the “fire” the toy breathes. An ultra-fine mist pouring forth from Torch’s mouth delights everyone, regardless of age. However, once the novelty of that wears off, it may be difficult for Torch to hold children’s attention. While users agree that the toy is amazing for short durations, they frequently find children losing interest after quickly after that. Additionally, younger kids can be entranced for longer periods, though they must understand they have to be gentle with Torch. Due to the mechanical parts and hard plastic, he’s not the best cuddler. Still, this seems to be a great toy when it comes to using in classrooms and daycares where children will likely only get to play with it for shorter times. We discuss the appropriate age range further in our Observations section. Weight: Approximately 6 pounds once batteries are installed. A crystal shaped tool is included to fill the water tank on Torch’s head. Tank holds 1 or 2 teaspoons of water. Do not overfill. Doing so may cause water to leak out of Torch’s head or mouth. Box includes Torch, crystal water vial, color-changing marshmallow, two extra reusable water filters, and instructions. 4 C Batteries are required, and NOT included. Use distilled water to help keep toy running smoothly. Pet Torch’s nose or press his belly to watch the baby dragon breathe fire! The fire is actually fairly convincing looking. An ultra-fine mist sails past a set of red/orange lights in the dragon’s mouth, lighting up the mist as it goes. Torch comes with a marshmallow toy, because that’s apparently what baby dragons are into. The marshmallow toy changes color when it gets wet, so hold it in the mist to watch it change into a nicely roasted brown color. Even though the ears, eyes, and head are the only parts that move, the movements created are very expressive and extremely cute. Sounds include baby roars, giggles, cooing noises, gurgle, and other typical baby sounds. Batteries are NOT included. Installing them takes some effort, so consider installing them before the child receives it for the first time. Just to be nice. Popping right out of the package as easily as can be, Torch immediately entices children with big eyes, button nose, and fluffy ears. Well, “immediately” may be an overstatement since Torch comes without batteries. 4 C batteries are required, along with a Phillips screwdriver to install them. Once up and working, Torch will jump between the fifty-something sounds possible. Rubbing or patting the nose will activate the sounds, including a tiny sneeze every now and then. Pressing the belly makes Torch breathe fire. The fire is really an ultra-fine mist of water that is colored red by some lights in the back of the dragon’s mouth. A marshmallow toy is included, which turns brown as it is “roasted” in the mist. It has to get fairly wet in order to change color, and most users found it to be a rather lackluster accessory. Once it dries out, it’ll go back to its regular color. Torch’s fire-mist is made from a small water tank on his head. This tank holds a very small amount of water, only about 1 – 2 teaspoons at a time. More than that, and water can leak from around the tank’s lid, as well as coming out of Torch’s mouth. While some kids may think it’s cool to have a drooling dragon, as an electronic toy, water really shouldn’t be leaking since that means somewhere a seal isn’t working properly. The included crystal toy is used to fill Torch’s water tank, and again, only holds a small amount of water. Each round of water can produce around 15 fire-breaths at a time, before needing to be refilled. In order to keep water from escaping the water tank, be sure to empty and dry out the tank if Torch is either going to be left alone for an extended time, or if the children playing with the toy tend to jostle and tip Torch over. 3 water filters are included (one is already inside Torch upon purchase), and can be removed and cleaned between uses if need be. The filters aren’t the easiest thing in the world to switch out, so expect to take more than just a few quick minutes to complete the task. Filters don’t need to be changed often. Be sure to use only distilled water though, since any extra particles in tap water can clog up or damage the toy. Gallons of distilled water can be bought at just about any grocery store, and are usually around or under a dollar for a gallon. As mentioned at the beginning of the review, Torch seems to appeal more to younger kids. Many users complained that after the novelty of the fire-mist wore off, the cute noises just weren’t enough to hold the interest of kids 7 and older for very long. We are a little concerned about this, because while kids around 4 and 5 really love playing with Torch, they are very disappointed when they are told they can’t move him around too much because of the water tank. Toddlers and very young children also tend to want to cuddle with him, and are a little surprised that he isn’t plush or squeezable. The toy is covered in soft fabric, but the body is hard plastic. Moving parts, such as the ears, shouldn’t be patted or pulled on too roughly, which may also be hard to explain to young toddlers. Overall, we’ve found this toy is better for younger kids, those under 7. It will require frequent adult help, such as with filling the water tank, changing out filters, and making sure no leaks are happening. Since the toy quickly loses appeal once the novelty wears off, we think the toy would be suitable for a rewards type of program in classrooms and daycares. Something where children can look forward to spending a short amount of time with Torch, so that the wow factor isn’t lost so fast. A number of users found they preferred some of the other critters in the FurReal Friends series. One popular alternative was Star Lily the Unicorn. We have not yet fully reviewed the unicorn, but this toy was mentioned numerous times as a better toy than the dragon. For more information on how to clean electronic toys, check out our Cleaning Guide for Toys. As of yet, we have not come across a place to buy additional filters. It seems that with proper care, there shouldn’t be a need for any new ones. We’ll update this page if things change after the toy has been on the market for a while. The toy seems to have more appeal for younger children. Due to mechanical parts, we highly recommend adult supervision to ensure younger children are not too rough with it. Additionally, the water needs to be refilled, the tank needs to be removed and dried during extended times of non-use, and the filters need to be changed periodically. This care will need to be administered by an adult or older child. FurReal Friends plush pets are all about rich pet experiences. Their exciting and engaging play helps to create unforgettable memories. 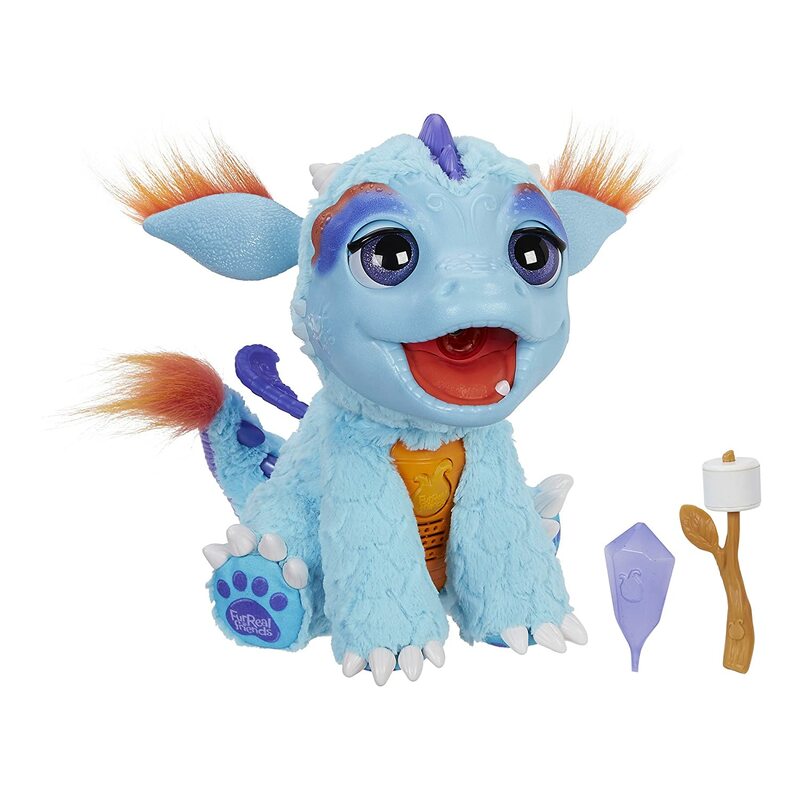 Kids can get carried away into a world of fantasy pet fun with Torch, My Blazin' Dragon. Imagine that he lives deep in an enchanted forest, inside a colorful crystal cave. One thing's for sure -- this adorable baby dragon with the fiery personality is full of fun and surprises. Take care of him and discover what exciting things this fantastical pet can do!